One thing many pet parents start to get anxiety over is the introduction of a new puppy to an established pack, or even just a single family dog. Best practice would dictate to make the introductions in a neutral territory, but what if you can’t do an introduction in a neutral environment and the introduction has to take place at your home? Since I was coming back to the West Coast from the East Coast I took a slightly different approach as I was arriving home late in the evening. If you remember I had set up the puppy’s new play area in my office. I knew that the moment I walked through the door when I got home I would be greeted by 4 bouncy little dogs, so I had to make sure to hand off the new puppy to my husband prior to walking into the house and since everyone would be distracted by me, my husband could easily whisk him away to the office undetected. My plan worked perfectly! The girls never noticed that the puppy entered the house as they were giving me kisses galore! My husband took Kevin into the office and placed him in his little play pen and waited for me to bring in the girls for a proper introduction. I started out by bringing each Shih Tzu into the room one by one so they could check out this little stranger that was going to be invading our lives. Since I know the personalities very well I watched for any signs of hostility, such as growling, barring teeth, hackles raised, straight tail, etc., not that I thought there would be any. Luckily for us each introduction lasted between 1-3 minutes depending on the dog and there were no signs of hostility. All introductions started out with the puppy in the play pen and the girl(s) on the outside of the pen. Within 15 minutes the puppy had been introduced to Riley, Trixie and Katie, and all seemed to be okay with the fact that he was home. 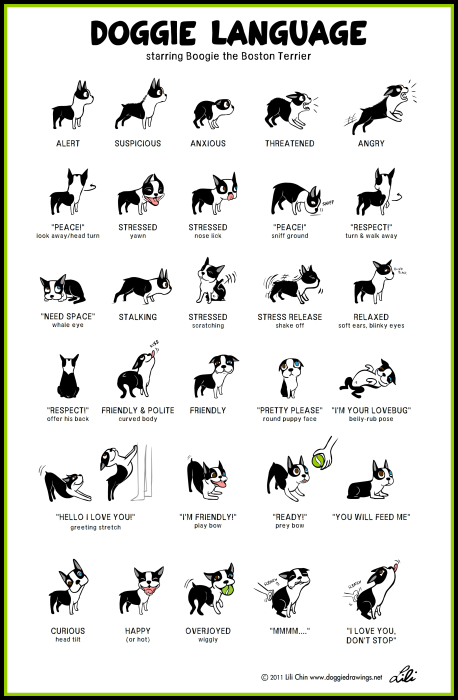 Since dogs don’t “talk” like we do, we need to make sure we know what our dogs are saying by their body language. Today I’m sharing a wonderful graphic by Artist Lili Chin and her dog Boogie on body signals. Now dogs have a lot of signals that they give to each other, so be sure to watch for anything out of the ordinary. In our house dog to puppy corrections are a much-needed lesson of life. Since Kevin hasn’t started puppy class yet, it is up to the girls in the house to set his boundaries. Now I only allow this because the corrections from dog to puppy are not that severe. Katie and Trixie growl, bares a little teeth with a little bit “in your face” action but does not actually make contact with him, Riley will roll him and keep him in a submissive position. All of which needed to help keep his craziness in line. Now corrections don’t hold true for all dogs in the house. As you may know I have a pretty large pack with 2 larger dogs than my Shih Tzus, one a Boston Terrier, who at 22 pounds is a muscled force to be reckoned with, along with a Husky/Border Collie mix who at 55lbs can cause some damage. When introductions were made I was very careful in watching all signals given by each of these dogs. Use the new puppies fur – This may sound weird, but I tend to brush the new puppy, or other pet and form a little fur-ball. I then have my cat smell the fur-ball to become comfortable with the scent. I then take the fur-ball and rub it on the cat. During this time the cat is calm and relaxed, I never force the lesson if the cat seems anxious or fearful. Cat meets puppy – after the cat seems relaxed with the smell of the puppy, I allow a personal introduction. Puppy is held and I allow the cat to sniff the puppy on her own, again I don’t force the cat, nor do I allow the puppy to approach the cat on his own. Cats are quick and tend to swat at the face, for puppies (or any other dog) this can be dangerous since an eye injury could result. On leash introduction – if the cat is still feeling relaxed the next step is to place the puppy on a leash for an introduction. During this time, as the times before I am watching for hissing, growling and raised hackles from the cat. I always want to make sure that I am not rushing the situation. Luckily for me, Ninja has been with other Shih Tzus since she was 5 weeks old and she took to Kevin happily. She is gentle with him, plays with him, gives him proper little slaps (no claws) when he pushes a little too much, and allows him to crawl on top of her and chew her ears. Yes she is a very tolerant cat. So hopefully if you’ve had a cat that has had contact with many different dogs in her critical socialization age for cats ( 2-7 weeks, up to possibly 10 weeks of age) then you will probably have a good luck introducing your new Shih Tzu puppy. For more information on cat introductions with other breeds of dogs and what to take into consideration I suggest reading Introducing Dogs & Cats by Jackson Galaxy. Lets face it, at some point you are going to have to leave your pets alone. But until you are 100% , without a doubt sure that the puppy would be safe with your new dog or dogs, don’t leave them alone together. After getting our puppy we stayed home with him for the first 3 days, but we finally had to leave him alone in his little playpen area in the office. What I soon realized was that he had never been alone by himself and this was a little too traumatic for him. Since he was getting along great with Riley I decided to give him free reign of my office with Riley. Since that was a success I then threw Trixie in the mix, and finally Katie. Within a week, we had created a safe environment for him when we left home with the girls. Remember your puppy depends on you. Don’t ever leave your puppy alone with an adult dog until you are 200% sure that your adult dog will not turn on your puppy. Now even after 7 weeks, Kevin is never unsupervised with Sunny or even Daisy. Though Sunny doesn’t bite, she will pin down another dog, that is her M.O., this in turn would crush Kevin and kill him. Daisy has a habit of hitting with her paws, again another possible eye injury. So know your other dogs and protect your puppy, even be a crazy helicopter mom for the first year. Your puppy is depending on you. What an excellent, thorough post! Your tips are perfect, & I love that you covered both large dog, small dog & cat intros. Sharing! Yayyyy! Congrats on the new puppy. When we brought home Blue, he got along great with Rodrigo and Sydney. We didn’t have the same experience when we brought home Scout and Zoey. Rodrigo was NOT a fan (lots of growling and lip curling) and Sydney wasn’t happy with the new additions (she ignored them). It took about a week until Rodrigo and Sydney realized the puppies would be staying and we developed a good routine. We liked the suggestions on introducing puppies to cats. Although, we hope Mom Paula doesn’t plan on bringing one into our house! Great tips here and nice to see you blogging, sweetie. I look paw-ward to following along! 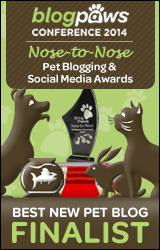 Great tips, I especially enjoyed the ones for the cats and using the puppies brushed fur for scent use. Thanks for sharing. The cat introductions were more tricky at my house than introducing Jon Farleigh puppy to my senior dog (she preferred to ignore him altogether). But we survived and all is only slightly dysfunctional! 😉 Glad you’ve had success at your house! Love this post. We are researching introducing a new step-sibling for our web series “Backseat Barkers”. Thanks. Congratulations on your new furry family member! I found your article really helpful, “packed” (pun intended) full of great information! I also love that you talk about introducing them to cats as well as dogs! Thank you! Great article! My daughter got a new puppy and even though she doesn’t live at home, the addition of a new puppy has changed the dynamics a bit. Rosa just loves to play with her and they spend hours together where Keira is really put out by the puppy. Keira is my senior dog and you can see in her expressions- “This again”? I hope everyone with a puppy is reading this! 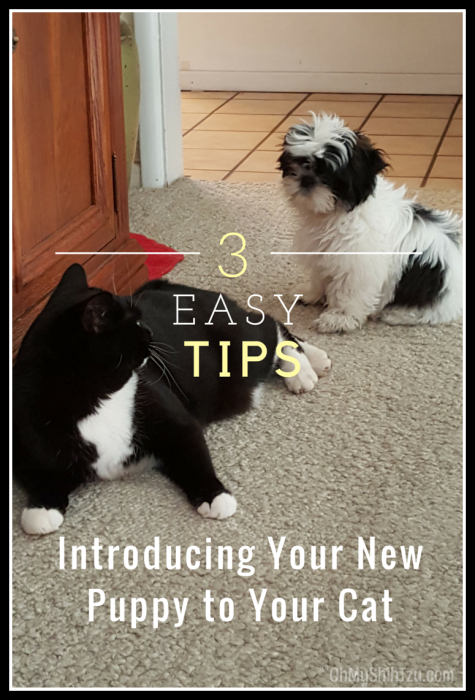 All great tips – the one thing I haven’t done is introduce a puppy to a cat but have many friends where that has worked out just fine! Jackson Galaxy is my hero! Congrats on the addition of Kevin to your home. It’s so important to get those first introductions right, so I was interested in reading about your approach. I especially love the idea of getting the cats used to the puppy fur via the fur ball method – just brilliant! All your effort and forethought really paid off! I’m glad it was such an easy transition and Kevin is a welcome member of the pack. I love the idea of the puppy fur ball as a way to introduce the cat to him. It sounds like your cat is amazing. This is a great article – and we love how you introduced Kevin to the kitty! For some reason, none of the pictures will load for me. I’ve refreshed the page three times, and the pics still won’t load. Bummer because I wanted to see the puppy. Mr. N was really good with the puppy we puppy sat but even then we kept an eye on the two of them just in case. They’re pretty similar in size though. Congratulations on your new little family addition. Very well written – should help many new pet families adjust. Great article, Christine. I hope to get a new puppy later this year and will be glad to have this info (especially concerning our cat). Thanks!